EmailPrintTwitterFacebookRedditGoogle+ SPONSOR MESSAGE Chalk up another win for Einstein’s seemingly invincible theory of gravity. 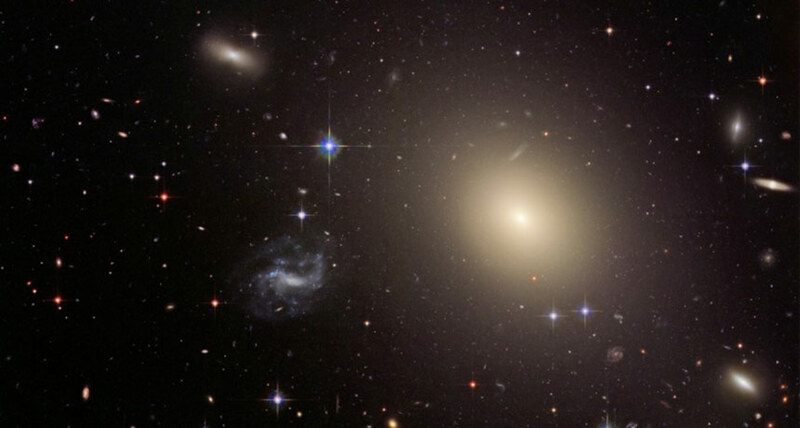 A new study shows that the theory of general relativity holds true even over vast distances. General relativity prevailed within a region spanning a galactic distance of about 6,500 light-years, scientists report in the June 22 Science. Previously, researchers have precisely tested the theory by studying its effects on the solar system (SN Online: 8/15/17). But experiments on larger scales are more difficult. The new test is the most precise one yet across such great distances. According to general relativity, the force of gravity is the result of matter warping spacetime (SN: 10/17/15, p. 16). In the study, the team looked at how light from a faraway galaxy was bent by that warping as the light passed by an intervening galaxy while traveling toward Earth. The closer galaxy, known as ESO 325-G004 and located about 450 million light-years away from Earth, distorted the image of the distant galaxy into a ring, like a cosmic version of a fun house mirror (SN: 10/17/15, p. 24).